Protect your transponder and connected equipment (laptops) from high current. Vesper Marine is compatible with all the leading brands of marine equipment and MFDs including Raymarine, Garmin, Furuno, Simrad and many more. 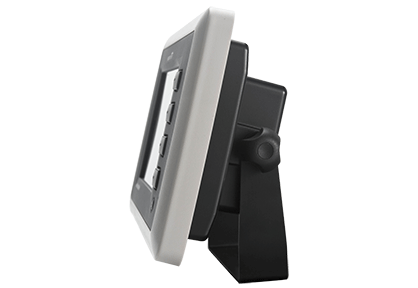 WatchMate 850, a fully standalone transponder with a 5" sunlight viewable screen is easy to use and loaded with features. WatchMate 850 is a Class B AIS transponder with a two channel parallel receiver and transmitter. It transmits your vessel position and details and receives the same kind of information from other vessels with AIS transponders. The AIS data is sent every few seconds and includes information such as course, speed, latitude, longitude, and heading. Static information about the vessel is sent every few minutes and includes the name, type of vessel, length, beam, draft, etc. Safety Underway. Continuously determine crossing situations, receive collision alarms with full vessel information for critical action. Safety at Anchor. Sleep soundly, knowing you’ll be alerted if your anchor is dragging. Safety for your Crew. Be alerted when your crew activate an AIS MOB device and see their current location for easy retrieval.. It means you can enjoy your time on the water, knowing your WatchMate 850 is always keeping watch in the background and is ready to alert you the moment it detects a hazard or unwanted event. Computes the closest point of approach (CPA) and time until CPA (TCPA). Alarms may be based on these and other factors. Vessels and alarms are presented in order of priority. In crowded operating areas the WatchMate 850 Transponder eliminates clutter by filtering out vessels with no collision risk. Triggers an alarm if a vessel will come too close. Sounds the alarm if any vessel comes within the specified range. Both CPA alarms and guard alarms may be used together for collision avoidance. Your safety is increased when offshore or in busy traffic areas. When night falls or the weather is bad it is often difficult to see other vessel's lights or determine their direction. The WatchMate shows immediately which way the vessel is moving and will even plot the crossing situation. You'll have each vessel's name and call sign and others using AIS will also have yours. If you wish to call another vessel you will be able to ensure you are talking to the correct vessel. This is very important when operating in busy areas or in bad weather when visibility is reduced. The anchor watch enables you to mark where you dropped anchor and sounds an alarm if your vessel moves outside an adjustable circle. It provides a helpful visual indication of where within your anchor circle the boat is located along with distance and bearing to the anchor point. Unlike any other product, when you have a heading input our anchor watch automatically corrects for the location of your GPS antenna on-board.This eliminates cumulative position errors and makes the WatchMate 850 the most accurate and useful anchor watch available. Includes a built-in GPS antenna that provides GPS data to the integrated 50 channel GPS receiver. This internal antenna allows for simple installation. However if needed, an external GPS antenna connection is provided and an optional external antenna is available. For best performance, the built-in GPS antenna requires a clear and unobstructed view of the sky. It usually works well when installed in a cockpit, under a non-metallic dodger or under a fiberglass hard-top. However, if you are mounting the WatchMate 850 transponder in a location which does not provide adequate GPS signal coverage (eg. near or obstructed by metal objects or "down below" at a nav station), we recommend using our external GPS antenna. You can use your WatchMate 850 to initiate an individual DSC call to any vessel displayed on your screen. This feature makes it easy to message nearby boats, requesting them to switch to a specific channel for a VHF call, without having to enter the other vessel’s MMSI number manually into your VHF radio. The DSC feature works with any VHF radio that accepts the NMEA-0183 DSC sentence. Displays received AIS Broadcast Safety Messages. These messages may contain important safety, navigation, weather, or shipping information. No external "black boxes" to mount, power and wire. Just plug in a VHF antenna and connect the WatchMate 850 Transponder to your 12 or 24 volt power supply. The WatchMate is easy to interface to these devices but none are necessary for its operation. The WatchMate 850 is a fully stand-alone AIS collision warning solution. Designed for minimal power consumption the WatchMate 850 is extremely well suited for energy conscious vessels. Energy conscious users know how important low power operation can be particularly on a long voyage when charging from solar or wind. 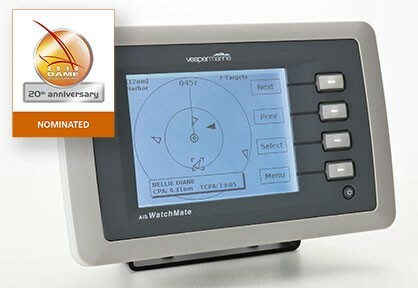 The WatchMate 850 consumes far less than a radar, chart plotter or computer. It takes power saving to a new level by going into a Power Save Mode causing the display and backlight to turn off when no targets are in range but waking up instantly when a target comes into range. The WatchMate 850 Transponder provides complete AIS and GPS output and is easily interfaced to chart plotters, radars or computers. The water proof USB connection can be used to connect the WatchMate 850 to onboard or home computers if required. Allows WatchMate 850 Transponder to be put in Silent Mode. When in this mode, the AIS receivers and GPS continue to operate normally and all alarms and other features, including the Anchor Watch, are available. The only change is that all transmissions are inhibited. Perfect for those times when you want privacy. In addition to the internal alarm, an external buzzer, alarm, or signal light can be interfaced withg the WatchMate 850 without requiring any additional relays (max 150mA). Includes Vesper Marine's patented AIS technology. For more information about our international patents, contact us. Galvanic isolated USB ports - Protect your transponder and connected equipment (laptops) from high current. Please Note: This information has been gathered from public sources. To the best of Vesper Marine’s knowledge it was correct at the time of publication (May 2017). We want to keep this up-to-date, so if you see anything missing or incorrect, please let us know so we can update this information.